Whether you’re a small start-up business or a well-established company with years of experience, you are probably well aware that promotion is crucial for developing and maintaining your success. Although most companies tend to think promotion means internet marketing and developing a presence on social media, one should never underestimate good-old physical promotion. And when it comes to physical marketing materials, promotional flags are one of the most popular trends. And why wouldn’t they be. After all, they are noticeable, affordable, portable and can easily be put up in any location. With that being said, the biggest benefit you can gain from advertising flags is that they help draw attention to your business when you’re attending a certain outdoor event, an expo, or are just promoting your products on the street. Since there’s a lot of advertising going on at these events, make sure that your business stands out from the crowd by selecting promotional flags that display your message in a unique way. This way, by making your stand more noticeable with feather flags, you’re essentially extending an invitation to locals, visitors and potential clients that are interested in what you have to sell. And by the time you even interact with them, they already have a clear idea of your general message so you can be free to get to the point and avoid unnecessary introductions. As a result, you get to say more in the limited time you’re generally given. This is very important at large events where people are quick to move from one stand to another by throwing just a quick glance. Another benefit of feather flags is that they are a one-time investment that offers continuing returns. While digital advertising is indeed impactful, it is nevertheless very expensive, and for it to have a prolonged effect, you need to continue spending money on it. Custom business flags, on the other hand, are permanent as long as they don’t get damaged. A simple flag with your brand’s logo, colours and message can be displayed indefinitely. 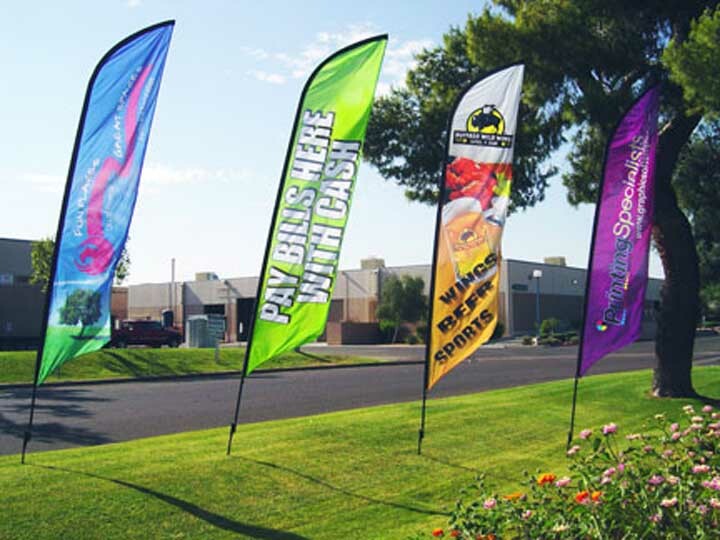 When it comes to choosing promo flags for your business, there are several options available. Confalon flags have a five-point shape and are suspended from a crossbar. They are very popular at schools and colleges, which makes them a great option if you want to advertise back-to-school sales or promotions. Another popular advertising flag is the feather flag. Because it’s tall and vertical, it’s very effective in drawing attention. There’s also the pennant which is popular at sports events, as well as grand openings as it can also have a decorative role.